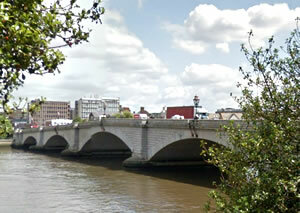 A major project to refurbish Putney Bridge has been given the go ahead. Wandsworth Council are to put out to tender a contract to upgrade the structure which was built in 1886 from a design by Sir Joseph Bazalgette. The decision was made after the Council was presented with a report showing that both the surface of the bridge and underneath needed repair work. A consultation is to be undertaken which will help decide whether the works should be done more quickly by totally closing the bridge. The alternative would be a longer project with only a partial closure. The work which is likely to take place in 2015 would require a complete resurfacing of the road over the bridge. Full closure of the bridge would last an estimated six months whereas partial closure would mean disruption for eleven months. £1.5 million funding has been identified for the project but this assumes that the bridge will be fully closed during the duration. The bridge, which is a Grade II listed structure, was last refurbished in 1995. An average of just under 14,000 vehicles cross it during the day time with over a thousand vehicles going both north and south during the morning rush hour. In 2010 the Council commissioned an independent specialist bridge engineer to appraise the bridge. They found that it had undergone a sustained period of damage from water leaking from Thames Water's mains that lie within the bridge. These have now been repaired with Thames promising a prompt response to future leaks but repair of the damage and measures to protect the bridge from similar problems in the future were deemed necessary.